Nearly three years ago, the co chair of the Grand Masters Maccabian team, Marty Bloom, called me to see if I would come on board as the coach of this team. When I agreed he told me that USA Maccabi execs said that coaches could not play. It would be too much work and that playing would interfere with what needed to be done. 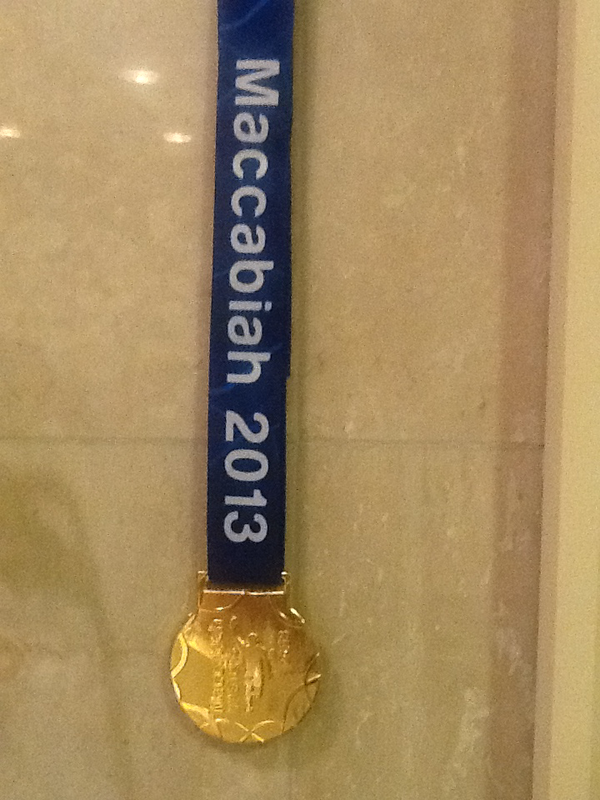 I had never won a Gold medal in the Maccabian Games. It was a hole in my tennis resume. So I, of course, had a different story. 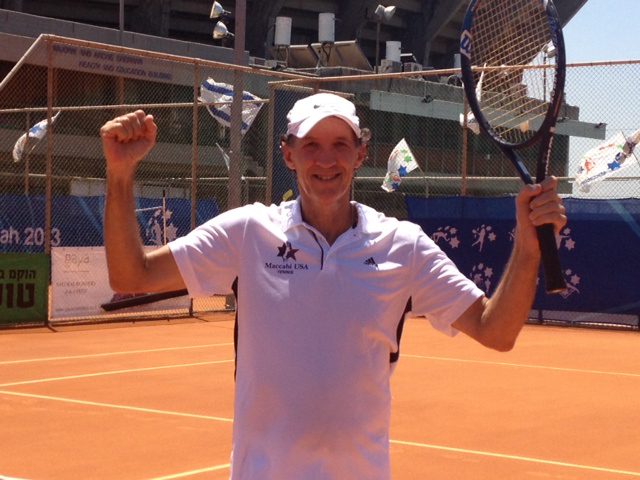 I could coach 23 slightly experienced players aged 65, 70, 75 and 80 and overs and I could compete as well. If they wanted me to coach then they would have to let me play. A typical story of mine of creating a high bar. People said that it would be too tough to keep my game at the level at which it needed to be to succeed. Not my story. I was considered the favorite to win the gold from the very beginning. From the outset I needed to fight off overconfidence and complacency. I needed to stay focused point by point. I did it all week and this morning I felt calm and confident that things would go smoothly. But I also know that you can never take anything for granted. 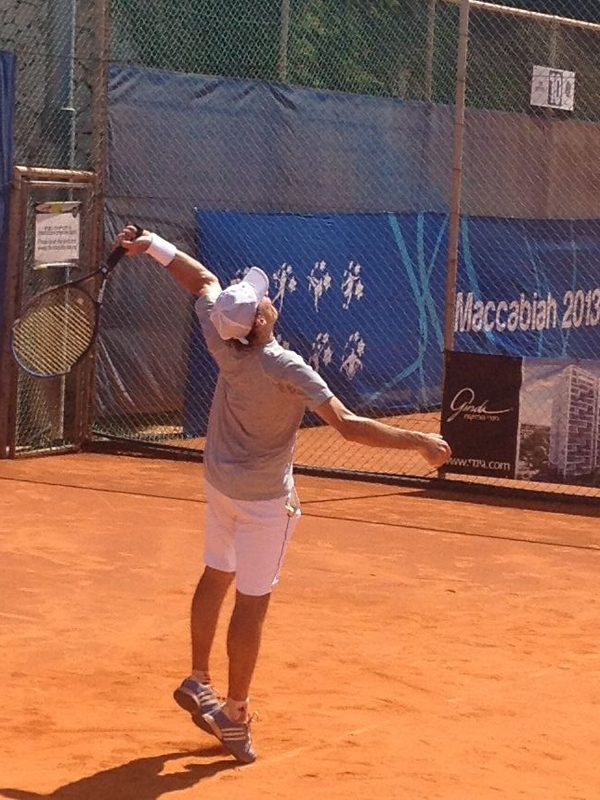 I knew Joe Oren, the #1 ranked Israeli player, from some International matches. He is a crafty player. I felt a little nervous excitement that is always there for me on the day of finals. Finals definitely feel different as coming in second often feels worse than losing earlier in a tournament. In finals the spread between winning and losing is greater than in any other match. I was aware of this and used my technique of letting go of counterproductive thoughts. So I was free of mental static. Ready to go to work to bring the best version of Bob to the court. 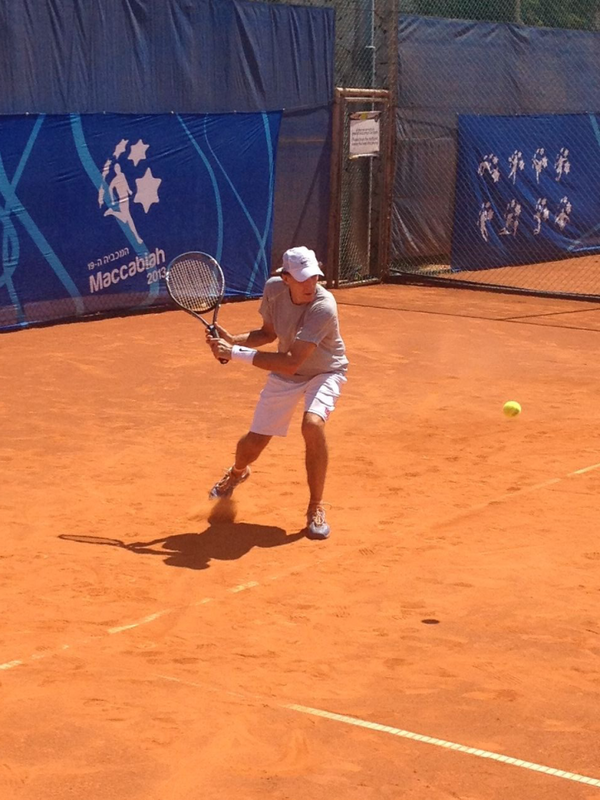 Things started well as I felt in control from the outset, going up 15-40 on his serve in the first game. And then I missed a few easy shots and he won the game. For the first time in the tournament, I was behind. No big deal or concern as I held my serve. He won another game. I held and was feeling like I was in charge at 2-2. He held solidly again. A little uh oh as I was serving from behind again at 2-3. Hmmm. I needed to adjust my strategy from trying to take out his legs by making him move side to side, as I was cutting it too close and making too many errors. I needed to cut back on misses. I held, broke and held by winning twelve points in a row to get to 5-3. I broke him again as he began to tire from the 100 degree heat and the fact that I wasn’t missing. 6-3 and one set to go. 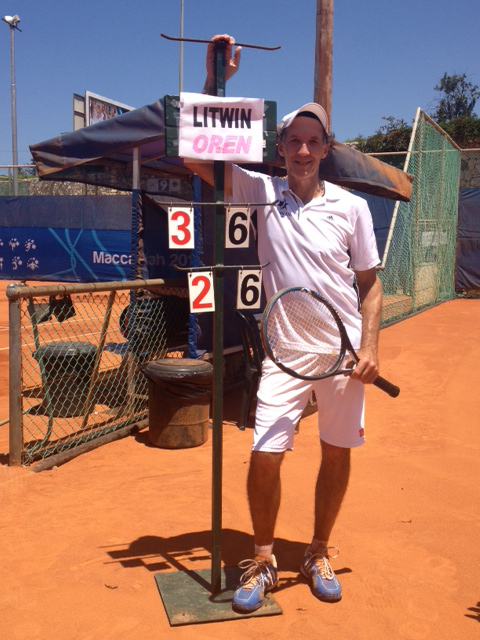 I went up 4-0, played a shaky service game and then, the details being unimportant, I closed it out 6-2 with a forehand winner. Excitement and relief. The pressure was more than I had let myself feel. I threw my hands up, ran to the side of the court, pulled myself up on the fence and kissed Jo Ann, who has made this journey special and part of the history that we are building together. Great feeling of satisfaction and accomplishment as I continued around the side of the court high fiving my teammates who were so excited for me asI felt indescribable support. Winning and helping my teammates win was a double Gold. Tonight there was a huge party and medal ceremony for all of the Master and Grand Masters competitors. I got to stand on the top of the podium, just as athletes do in the Olympics. Special stuff. Special once in a lifetime experience. The energy amongst all of the players, medals or not was powerful. Lots of high fiving. And my teammates, all strangers 6 months ago, all got big hugs from their coach. Joy. Pride. Love. New friends for life. A special shout out to Lonnie Mitchel, my amazing assistant coach, the Head Tennis Coach of SUNY Oneonta, who was my partner throughout. Together we were the parents of the special group of formerly, semi experienced players who leave with medals, wins and life lessons that they will have forever. Pix of the medal ceremony will follow tomorrow. Congrats Bob! Good to see good things happen to good people. Wow! Terrific! Lots of hard work and well deserved! Bob; Double congrats on winning the gold and coaching the rest of the team to win so many gold medals. Glad Jo Ann was there to see you win. A sweet story, well earned. Congratulations. I continue to learn from your lessons. My thanks and gratitude. Congratulations to you and the entire team. Nancy and I enjoyed the journey. It’s been a pleasure, to follow your blog, Bob. I always learn so much from your thoughts that I can take away and apply. Congratulations to you and your team, and thanks for the insightful observations. Great to see the photos of the grandchildren! OMG!! What a trip. I feel so lucky to have been able to ride along on your coattails…reading your oh so wonderful blog!!! Many, many congrats to you and Jo Ann. While we were confident you would win, we kept checking for your email since noon, NY time. Way to go Bob! Well done Bob and best wishes for a duplicate effort at Seabright NJ. Bravo Bob! Gold is a wonderful achievement, and the way you got there by writing YOUR story over the last 3 years is a powerful inspiration to all of us. Thank you Coach Bob! Great job of coaching and playing! You keep raising the bar! Never a doubt……..thanx for the updates. next, Sea Bright…..
Congratulations to you, the team, and your family on this honorable win. Thanks for taking the time for sharing the writing and action filled photos. You’re always #1, on and off the court. Huge congrats and a mega mazal tov Bob. Great story. Great accomplishment. You are a real talent. I always enjoy reading along! Congrats Bob!!! Amazing story, you are truly an inspiration!!! Well done on so many levels….. So proud of you, for your achievement and your great attitude. Your mental attitude is so superior that your opponent has to have substantially before physical skills to beat you. You are an inspiration to those of us who aren’t improving our technique anymore but can get better by improving the mental side of the game especially in competition. Don’t forget you won a gold with Steve Gottleib. 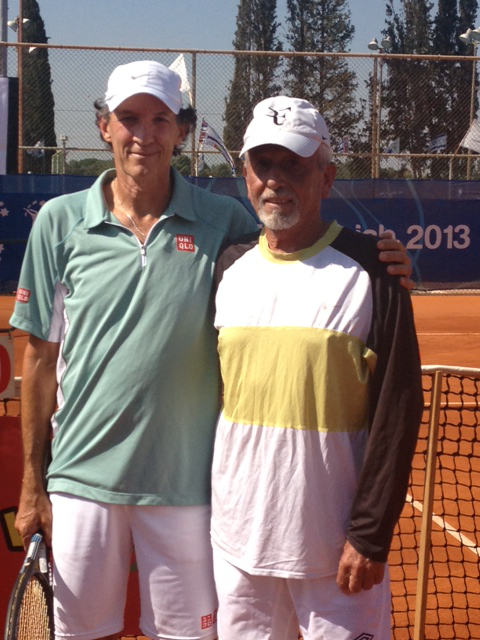 When I went 4 years ago (60s) the coach played in both singles and doubles. I guess they changed the rules. Please keep those blogs coming. Congratulations and you deserve all the credit for handling everything and giving your inspiration to the other players. Sorry I didn’t make the trip. Laurs & I had no doubts but we all know anything can happen. So, all credit to you for keeping it together with great perseverance. Best of luck for the balance of the season!!! Thanks for bringing me and the rest of us following your blog on a wonderful journey. I found myself thinking about you today and figuring what time it was in Israel. Congratulations to you and the rest of the team. Looking forward to talking to you when you return to get more of the behind the scene details. Reading your posts almost made me feel as if I was there with you. It’s a beautiful thing! Terrific experience for Joann and you! The win, icing on the cake. Congrats! great job all around. and great to share it with your second angel. c u back in the States. WOW!! Congratulations! Gave us the chills! You are terrific and such an inspiration. You remain so focused. Can’t wait to hear more! Have a safe journey home, and we look forward to seeing you and JoAnn when you return. Congratulations Bob, to you and the entire team. It’s been exciting to follow your story over the last week….your focus and intensity are so strong, and you know that you provide great motivation to many others. Congratulations on a wonderful accomplishment….here’s to many more! WOW. How wonderful for you, congratulations to you and your team ! Great win and great tourny, very happy for u and proud to call u my tennis guru. C U back at the Rock! Congratulations on winning the Gold. Your playing and your blogs were a joy to follow..
You and joanne should enjoy this wonderful time together. Bob…. congratulations and best of luck on YOUR surface, grass! Mazel Tov, Bob! Glad you won your long overdue Gold Medal and that Joanne was there to share it with you. Safe travels and best of luck at the grass courts. See you at SRTC soon. You are a wonderful example of a life well lived. It is a privilege to know you . The awards are great how you hold them and the journey it took to get them is even better. All my love and deep respect to you and JO Ann. WOW Bob! Hello to JoAnn too. Bob you are the man, well done! Are you good or what! Congratulations to you and your teammates for your tremendous success! Congrats Bob!! Staying is focused is true in all of life. Bob-your hard work, both on and off the court, have proven once again to keep you at the top of your game, while motivating all others that surround you. Congratulations to you and your teammates for achieving what you set out for yourself and your team. May you have continued success on and off the court. Well done! Contratulations on another victory Bob! I admire the passion, perserverance & focus you bring to everything you do, including your wonderful support of the SASS Foundation For Medical Research’s Annual Tennis Outing and Carol Litwin Memorial Award. Bob: Words cannot describe how wonderful you were and are in all respects: You fulfilled your duties as a coach with great zeal and real affection for all the players on the Grand Masters- you were and are a continuing inspiration to all us “old guys”. Add to this your great play in achieving a gold medal win in singles. We all owe you a debt of gratitude. From one of you players. Sam Sporn.